Healthy fish tacos made with fresh wild caught cod. Pan grilled cod tacos are nutritious on their own, but when topped with slaw and avocado cream sauce one taco is a complete meal! 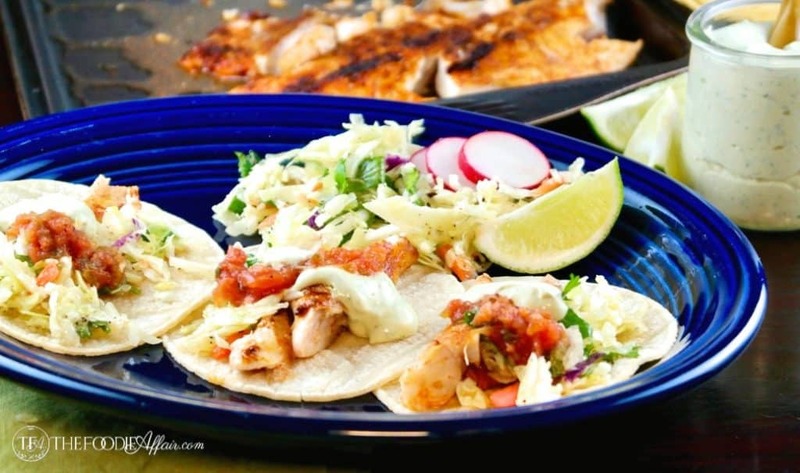 If you are looking for healthy fish tacos recipe, then you’ve come to the right place! Not only are these a snap to make, but these tacos are so tasty we had them twice this past week! 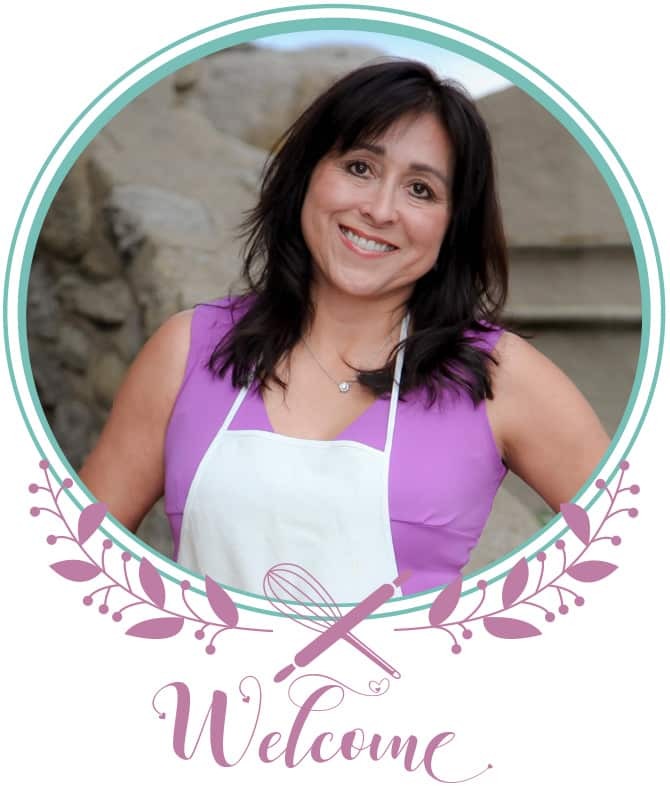 OK, tell me how you determine what you will be cooking for the week? Are you a planner with advance meals and a rotation of your favorite recipes that you make every week? Or do you wander through the grocery store looking for inspiration? My meal planning is not consistent. We do have a couple of favorite recipes like this skillet chicken enchilada dish and this cabbage beef skillet recipe. I don’t often make the same meals twice, unless it’s super-super good like these tacos! Lately, I have been paying attention to what is on sale at the grocery store, and base meals on the best deal I can find. Whenever wild caught seafood or organic meats are on sale at the grocery store I make sure to take advantage of the savings. This week wild caught cod was on sale for $7.99 a pound! The seasoning used in this recipe will taste great on any type of fish, but cod is one of my favorites. Cod is mild tasting, so it can easily absorb the spices that is added to it. In addition, the texture of cod is dense, which gives the tacos a hearty filling. There are some health benefits that is worth noting as well. Cod is low in calories, a good source of natural omega-3 fatty acids, and an excellent source of vitamin B-12 as well as a plethora of other healthy nutrients that are good for us. For these tacos I gently pan grilled the filets just under 5 minutes each side, which is a healthier alternative to battered fried fish tacos. 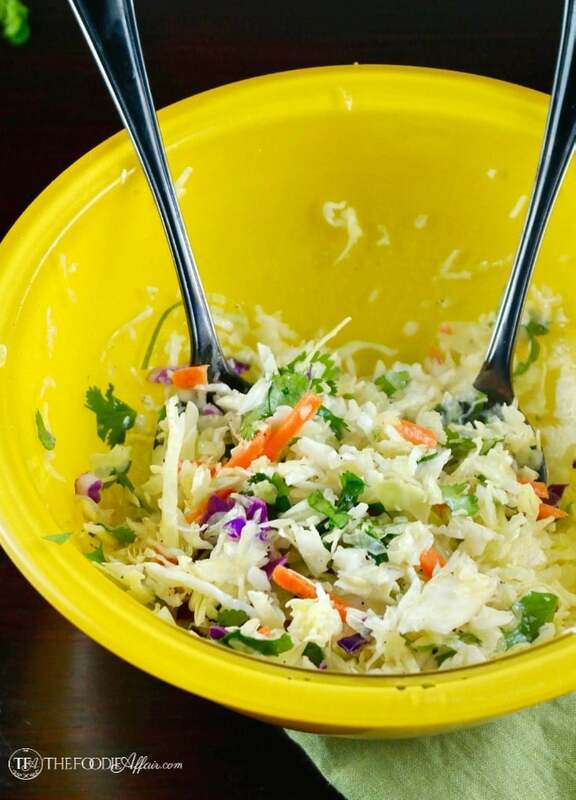 The crunchy texture of freshly made slaw tastes so delicious in fish tacos. The ingredients I use are simple bringing out the natural sweetness of cabbage. Don’t skip this additional condiment and add the avocado cream sauce I share with you last week too! Plate up these healthy fish tacos on your favorite type of tortilla. Street taco or Baja-style tacos are usually served on mini corn tortilla like the 4 1/2 inch ones from Guerrero. Three tortillas are about 5 carbs each. La Tortilla Factory and Mission Foods are both now carrying low carb tortillas in regular taco size (under net 6 carbs depending on the size and type). This is great news for ketogentic diet followers like myself. 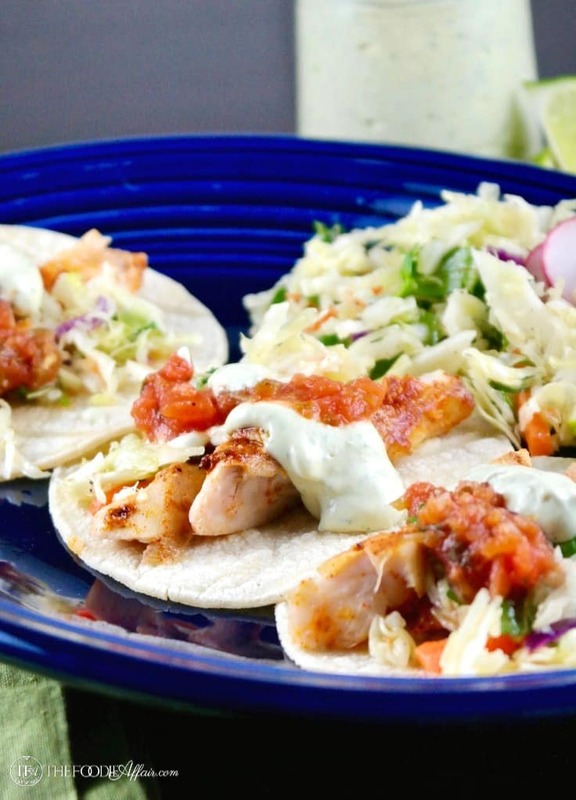 Make these fish tacos this week! You’ll love them. Promise. 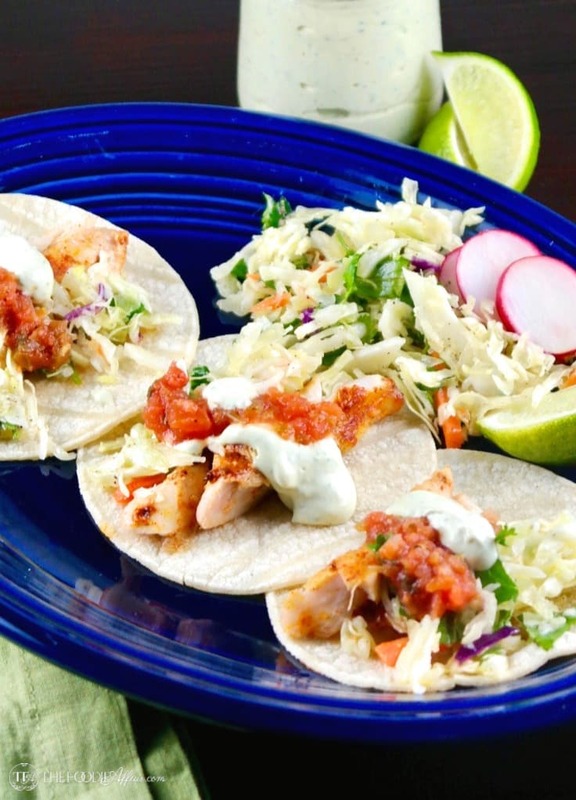 Simple and flavorful cod tacos with slaw and avocado cream sauce. Use your favorite type of tortilla for a complete meal. In a small bowl whisk together chili powder, cumin, garlic salt, onion with olive oil and fresh lime juice. Spread on both sides of fish filets and let sit for 20 minutes. In the meantime mix together cabbage slaw, cilantro, olive oil, salt, pepper and lime juice. Lightly grease a grilling pan (olive or avocado oil). 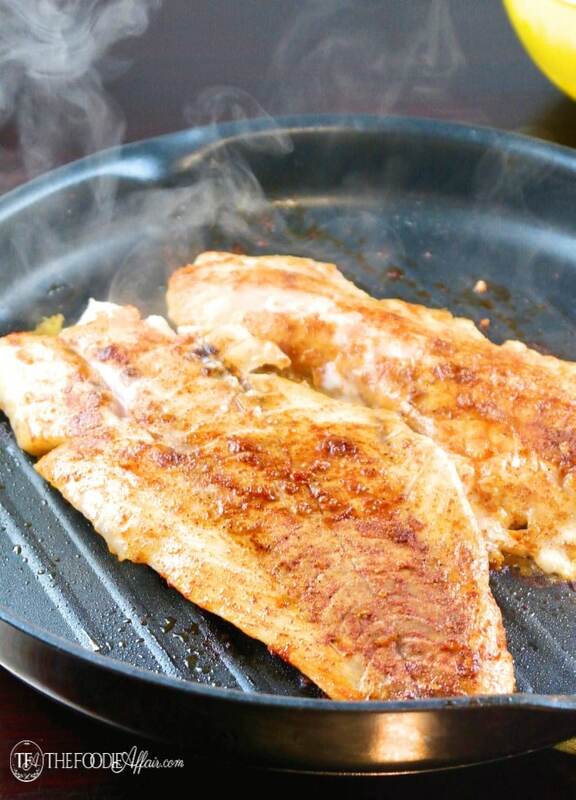 Over medium high heat cook the fish for 3-5 minutes on each side or until cooked thoroughly. Remove from pan and let cool. 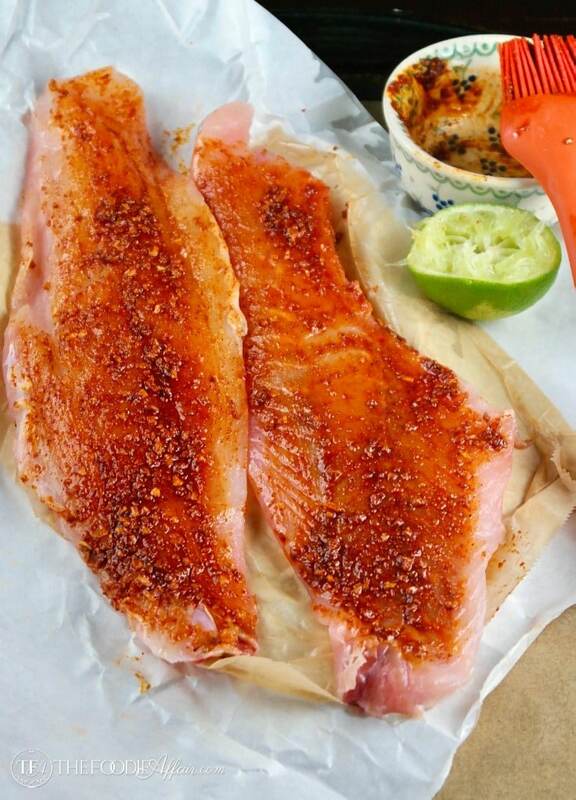 Once cool, gently break apart the fish with a fork into bite size pieces. To serve, warm tortilla, add fish, slaw and any other condiment you would like. Enjoy! Tortillas nutrition data are not incorporated in this recipe. When I lived in So Cal I drove right by the fish taco place until one day I got up the nerve to stop. It just didn’t sound good… then I stopped and I was absolutely hooked! Fish tacos are the BEST – your recipe sounds so good and I bet you’re right, one delicious taco topped with slaw and avocado? A meal in itself! 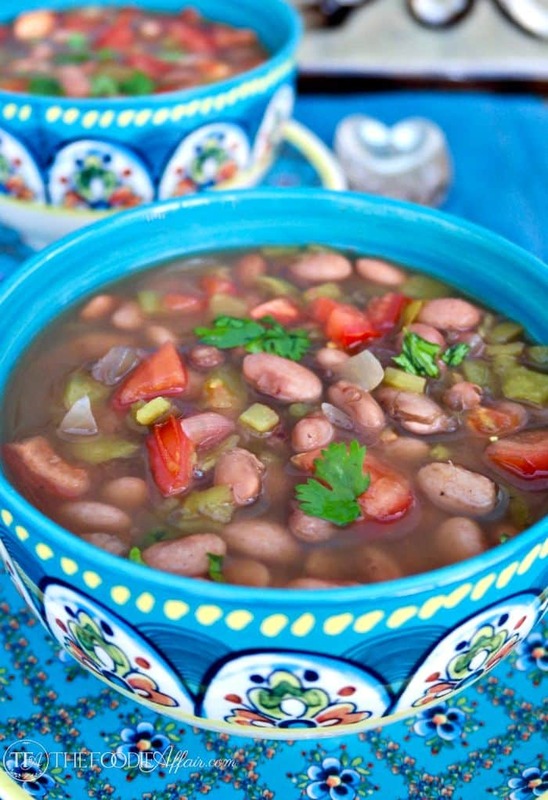 Great recipe, can’t wait to try it! These look sensational!! I am so trying them!! Thank you for the great recipe! Enjoy, Michaela! We love them and I bet your family will too. Love seafood!!! These are perfect, I am saving this for Lent! Love it!!! Yes please!! 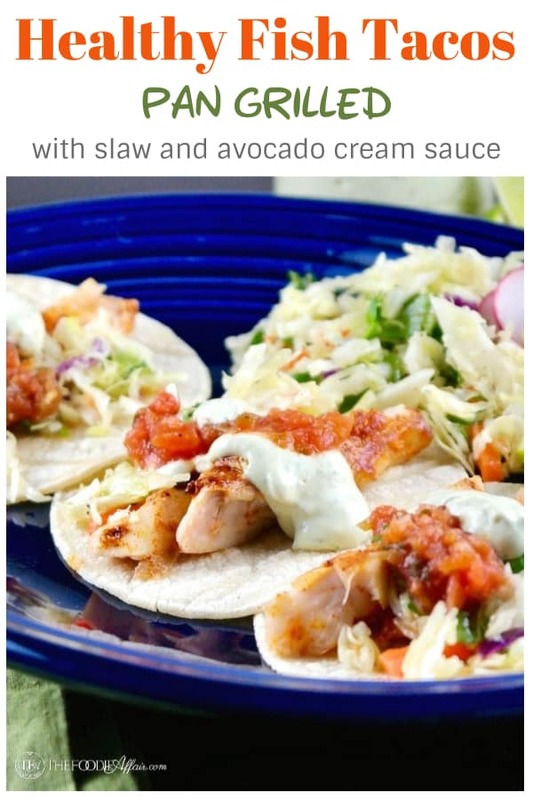 These tacos sound incredible! Really nice bright fresh flavors! Thank you! These tacos are delicious! I love me some fish tacos!! They’re so delicious and quick to make. Fish tacos are the best! I need to make these for dinner, they look awesome! Can these be marinated longer, I like to prep in the morning so my meals are easy to finish at dinner time. Hi April, The lime juice will tenderize the fish too much and you may get mushy fish if it’s left on too long.